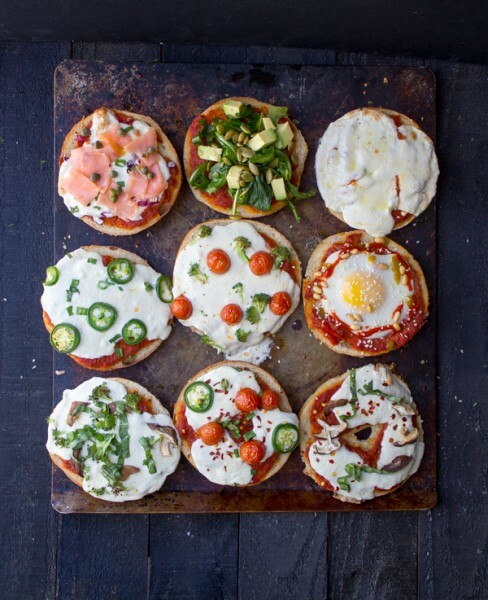 Pizza in the morning, pizza in the evening, pizza at supper time… it’s always time for Pizza Bagels!! 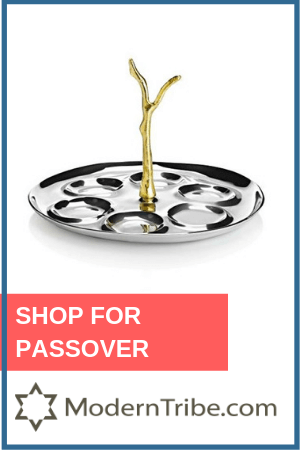 No, not Hanukkah. Not even my birthday. 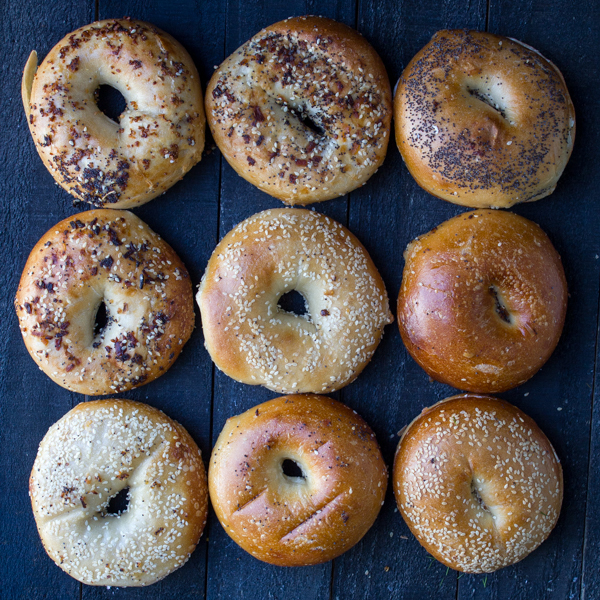 It’s National Bagel Day! I don’t make these things up, y’all. 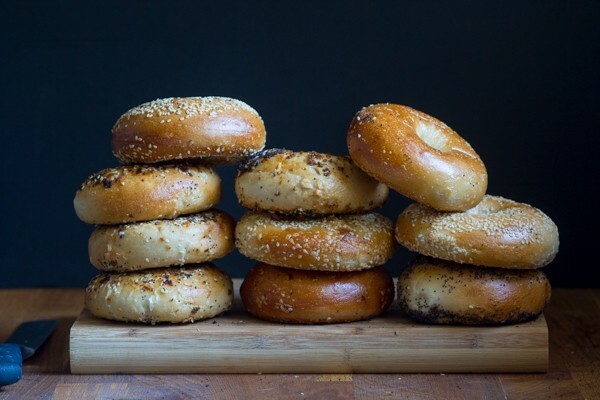 But you know if I did, we would have bagel day at least once a month quarter. 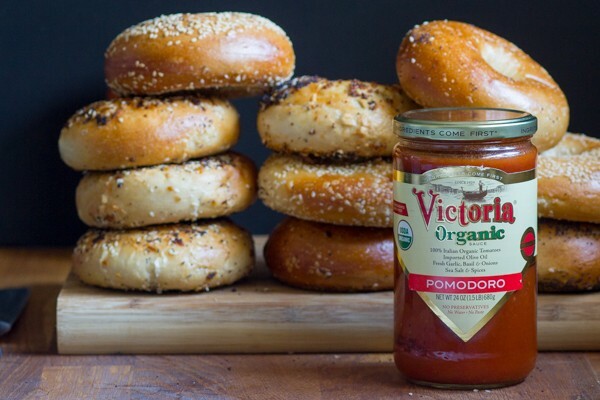 In the past I’ve celebrated with making homemade lox, bagels, rainbow bagels (all the rage suddenly!) and even a bagel inspired salad. 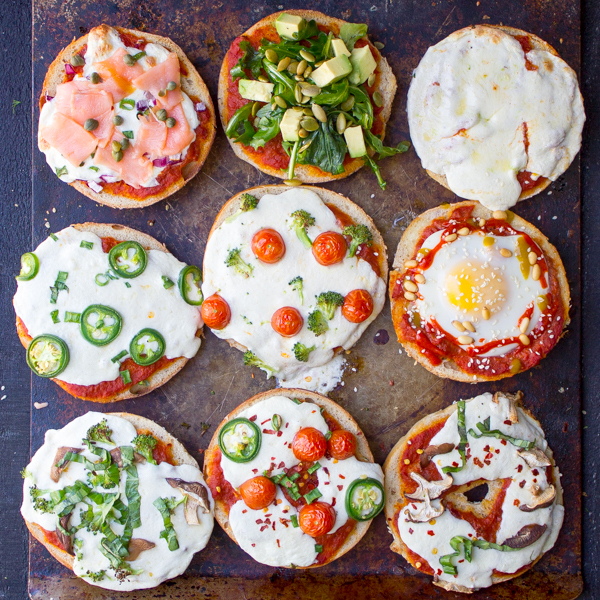 The best part of these, is you can literally top your pizza bagels with anything your heart desires. Peppers, anchovies, mushrooms, brisket…anything! 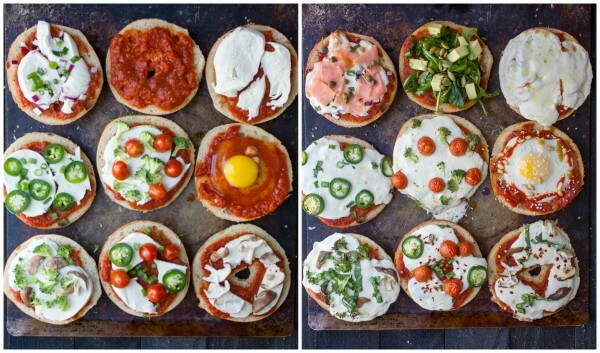 You can even pre-assemble these and pop them in the freezer when a late-night pizza bagel strike hits. 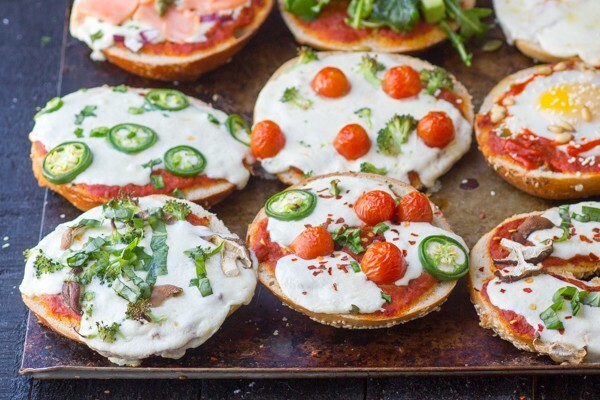 Did anyone else grow up with mini frozen pizza bagels? I’d come home from school, turn on Oprah (love her) and heat up some pizza bagels. Life was grand. But today, I’m happy to take these homemade variety and Jeopardy reruns. I’ve clearly grown a lot. Before and after. My kind of makeover. Here’s what we’ve got here. From left to right: Lox, Caper & Red Onion, Cheeseless with Arugula, Avocado & Pepitas, Just Cheese (Fresh Mozzarella! ), Jalapeño & Green Onion, Tomato & Broccoli, Shakshuka (!) aka Egg, Hot Sauce & Pine Nuts, Basil & Shiitake Mushrooms, Tomato, Jalapeño & Red Chili Pepper Flakes and Mushroom and Basil. Whew! Break that yolk. 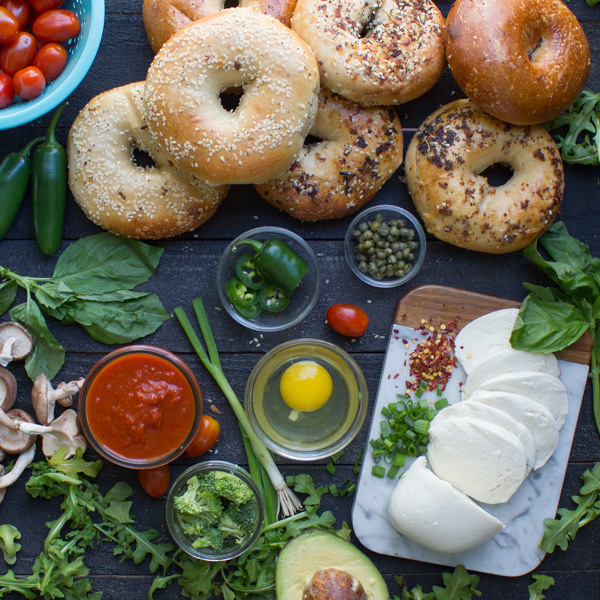 I incorporated all my favorite flavors into my choices- jalapeño and avocado for my Texas roots, Lox and Capers for my Jewish roots, Shakshuka for my love of Israel! 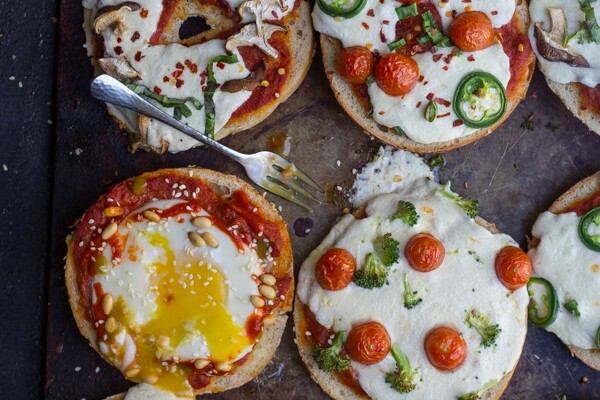 Pizza in the morning, pizza in the evening, pizza at supper time... it's always time for Pizza Bagels!! Toppings! I used cherry tomatoes, jalapeños, shitaki mushrooms, arugula, avocado, green onions, fresh mozzarella, capers, red chili pepper flakes and an egg! You do you. Preheat oven to 400 degrees F with an oven rack in the middle. 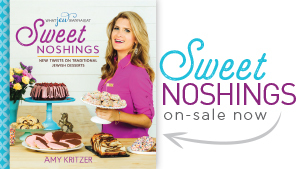 Place bagel halves face up on 1-2 cookie sheets. 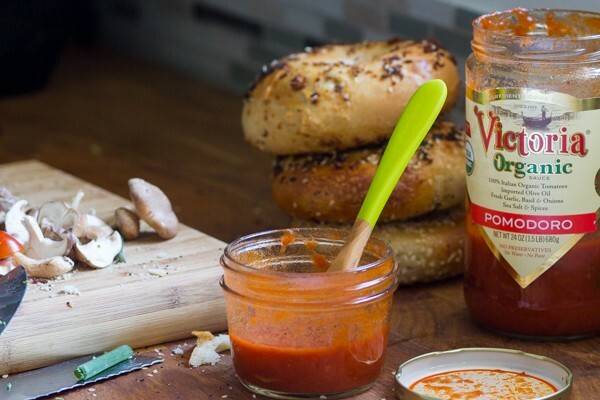 Top bagel halves with a layer of pasta sauce and desired toppings. I saved cold toppings, like lox, avocado, arugula, capers and fresh basil and put them on after. 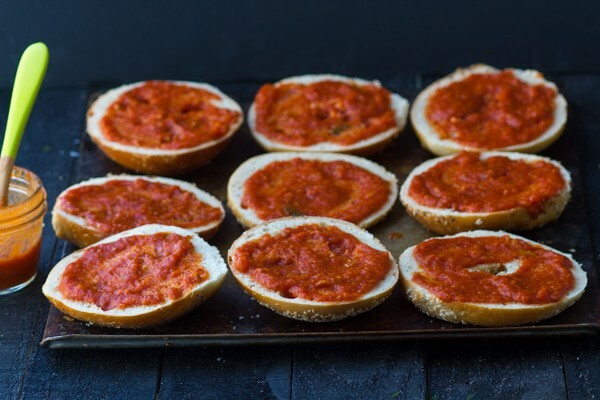 Bake for 12-15 minutes or until cheese is gooey and melt and bagels are toasted. 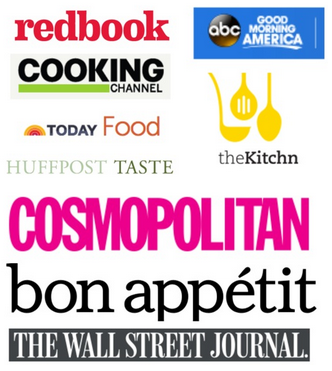 Top with remaining garnishes and eat right away! For the egg, I dug out a bit of the middle of the bagel and used it to block the bagel hole, and also give the egg somewhere for it to sit. Cook until egg whites and set and yolks are still runny. It should also be 12-15 minutes! 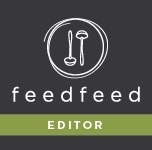 I partnered with Victoria Fine Foods on this post. 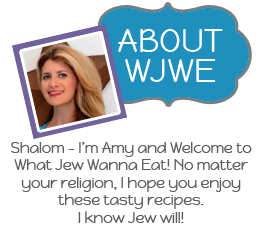 Thanks for for supporting WJWE. Jew rock! 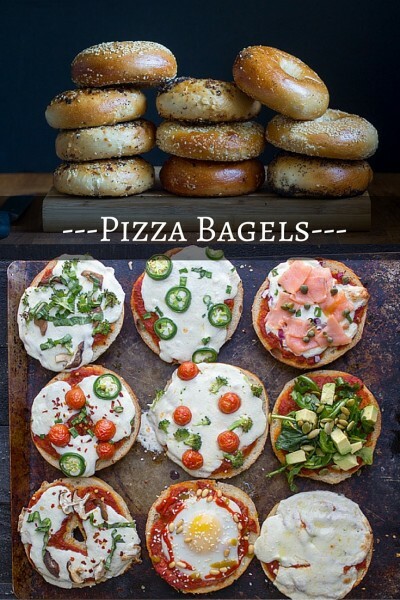 I want ALL THE PIZZA BAGELS!